Walk for Life is a new program in optimal gait dynamics that helps participants learn to walk “the way Nature meant.” Developed by Ruthy Alon, creator of Bones for Life® and founder of the Foundation for Movement Intelligence, this program is based on Ms. Alon’s prior work and 40+ years’ international experience as a Senior Trainer of the Feldenkrais Method of movement re-education. 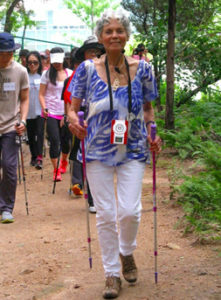 In this program the use of walking poles not only helps us to maintain equilibrium, but also redistributes effort, reviving our arms’ primal function — like the front legs of quadrupeds — to produce pressurized impacts into the ground. In format, the Walk for Life program consists of experiential indoor movement lessons to convey simple-yet-potent strategies that effect beneficial long-term change in flexibility, coordination, posture, strength and well-being. It also incorporates a real-world outdoor component — walking in nature, using Nordic poles — to help participants integrate patterns characteristic of a lively, pleasurable and health-promoting walk into their daily lives. Factors covered include optimal alignment, coordination, pace, propulsion, timing and impact. Improvements in balance and gait have been validated by the University of New Hampshire’s Department of Kinesiology. Walk for Life participants improved their walking speed, step length, and time spent on each leg during walking. They also experienced an improvement in their overall balance confidence.